Additionally, the coast station measures barometric pressure, solar radiation, and sea level (by measuring water pressure). All measurements are collected by dataloggers on the stations. All variables, excluding water level, are sampled at one-second intervals (water-level values are sampled at one-minute intervals). The measured values are averaged over a ten-minute period and a dedicated computer retrieves the averages every hour. 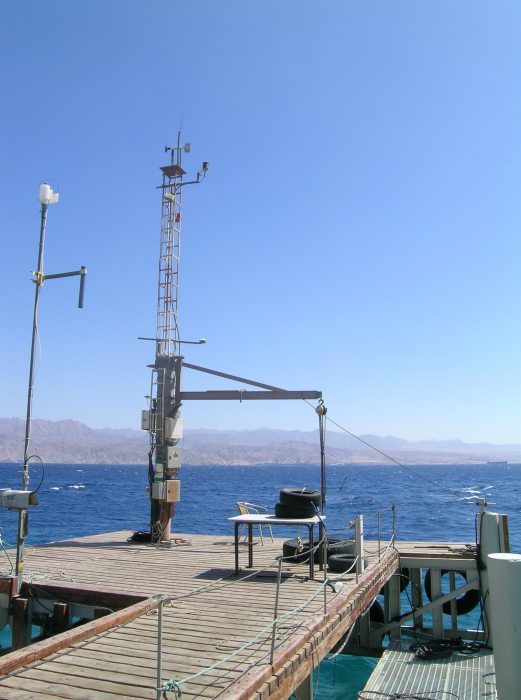 The data are stored on Meteo-Tech’s server (www.meteo-tech.co.il/eilat-yam/eilat_en.asp). The coast station’s data is free and available for public use. The open-water station is restricted to registered users only. The coast station is situated on the IUI pier, about 30 m off shore. The station started operating in September 2006 and operates on Israel Winter Time (GMT+2). Twice a year Meteo-Tech performs preventive maintenance, including accuracy checks, cleaning, and bearing replacement. The open-water station is situated on a floating buoy about 1 km off shore. The station started operating on July 2008. Unfortunately, a commercial ship collided with the buoy and heavily damaged it. The station was insured, so a rebuilding of the station is expected soon. Wind speed and direction, air temperature, and relative humidity are measured from the top of the main mast on the pier, 10 m above sea level (at low tide). The sensor for barometric pressure is located 5 m above sea level and the measurement is corrected for sea level. The sensor for solar radiation is fixed on a cross-arm extending 0.7 m due south from the main mast, some 6 m above sea level. The water pressure sensor is encased in a 3-m-long vertical metal tube 3 in. in diameter, fixed to the main supporting pole of the pier (which is a downward extension of the main mast). The encasing metal tube is meant to attenuate high frequency oscillations (i.e., waves). The sensor is located 0.79 m below sea level (calibration to Israel sea-level datum is courtesy of Dr. Dov Rosen) and also measures water temperature. An additional, dedicated, water-temperature probe is located approximately 1 m deeper, fixed to the main pole supporting the pier.